While visiting my parents, their neighbors kept delivering their home-grown zucchini to the house. I tell you their garden must have been exploding because they brought over a bunch every other day! Of course, we all enjoyed it. And, I was sent home with a huge bag of zucchini when we left! There really is so much to do with zucchini. If you are at a loss, gather some of our ideas and head to your kitchen to explore some delicious and easy ways for you to serve your zucchini! The multiple ways to enjoy zucchini . 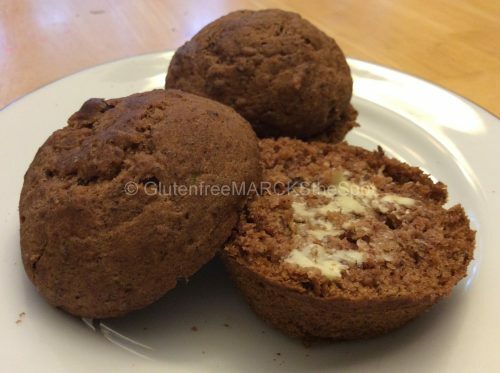 . .
We are BIG on gluten-free muffins at our house – so of course this was one of the first items we made. 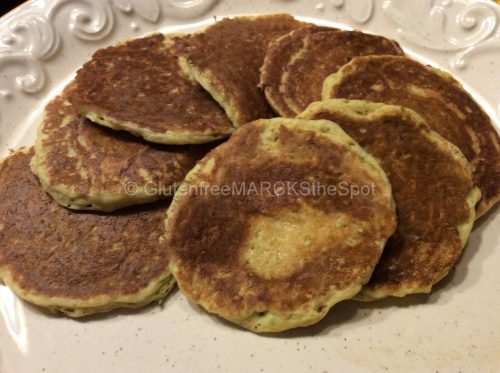 Zucchini muffins do not last long at our home! 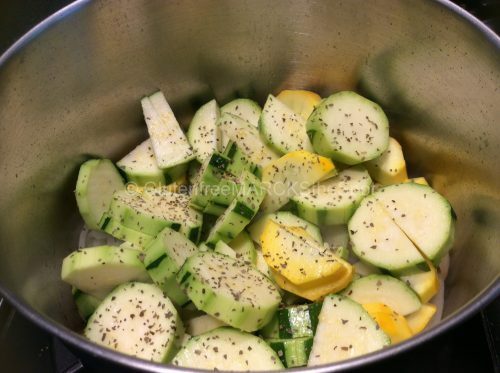 One of my favorite summer dishes is simply sautéing sliced zucchini with summer squash and onions. Simply slice all three veggies, add to a pot with a little olive oil and fresh chopped or dried basil. Then, sauté about 10 minutes or so, until softened. Absolutely delicious! While we were visiting family, my parents’ neighbor brought over a ratatouille dish she had prepared. Ruby, had prepared her dish with sliced zucchini, summer squash, tomatoes, potatoes, lots of seasoning and cheese. It smelled amazing and everyone enjoyed it. Unfortunately, with cheese it was out for me. So, we declared we would make one when we returned home. 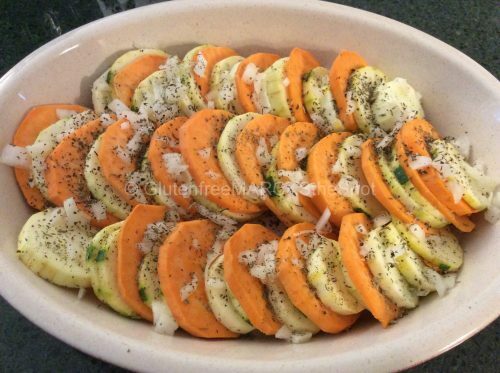 In our dish, we simply layered sliced zucchini, summer squash and sweet potatoes. Next, sprinkled them with basil, parsley and some chopped onions over the top. Then, baked the dish covered for about 30 minutes at 400°. You can see the picture before I baked the dish. But, truth be told – when my family walked in and smelled dinner, they dug right in and devoured it before I could say, “STOP I needed a picture”! Easy and delicious! And, everyone loved it! 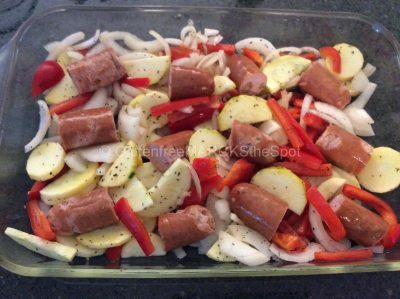 Another simple dish is a sausage and zucchini bake. Slice up a large onion, a red pepper, a zucchini and a summer squash. Toss all with a little olive or coconut oil. Chop up Italian chicken sausage and spread that on top. Bake in the oven for 30 minutes and dinner is done. Delicious on its own, or serve over quinoa or brown rice. No leftovers with that one! 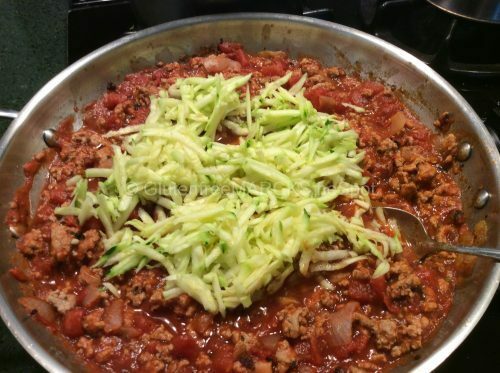 One night I was making our basic, quick pasta meat sauce – can you guess what I added this time? Yes – zucchini. I grated a zucchini and added it right to the sauce. Just stir it in and let simmer for a few minutes before serving. Hehe, no one noticed, and all asked for seconds! Now that is a good mama trick if your kids won’t eat their veggies! Zucchini bread, much like the muffins is another favorite. 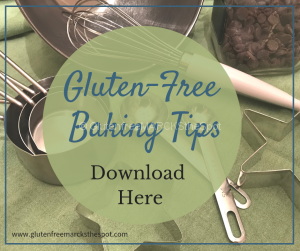 Try adding dark chocolate chips and the kids think they get a treat! Yet again they will be eating their veggies. Zucchini boats are delish! Slice a smaller or medium sized zucchini in half, scoop out the seeds. Fill each half with sautéd veggies or meat sauce, or even your favorite chili. Bake for about 30 minutes. Yum! Instead of using eggplant, make Zucchini Parmesan. 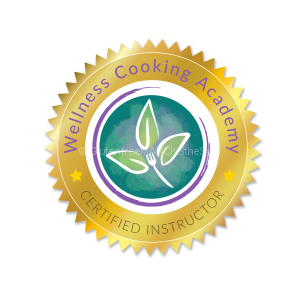 Slice the zucchini, drag it in coconut milk, then in millet or organic brown rice flour seasoned with basil, parsley and oregano. Spread slices out on a baking sheet and bake for 10 minutes per side. Then layer the slices in a baking dish, cover with pasta sauce and bake for 15 minutes. If you eat dairy, add cheese on top and melt under the broiler before serving. Serve with quinoa or pasta and a salad. Delicious dinner. Tonight I needed a quick dinner. This time instead of the smaller size I typically make, I cooked larger pancakes. 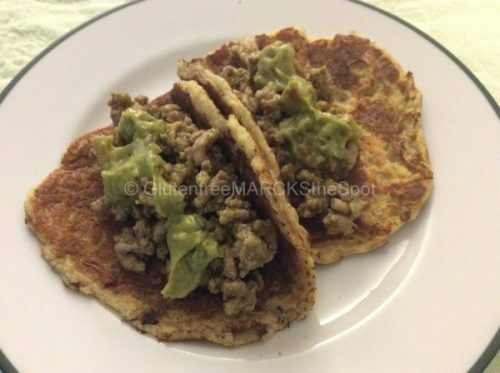 I made our super quick and easy taco meat and used the zucchini pancakes as the “taco”. Genius! We all loved them! The zucchini added a nice sweetness that calmed down the spiciness of the taco meat. Definitely a meal I will make again. All in all, dinner doesn’t have to be complicated. Just get a little out of the box and be creative. You will have delicious, easy meals on your table in no time! Have fun in the kitchen with all that summer zucchini! 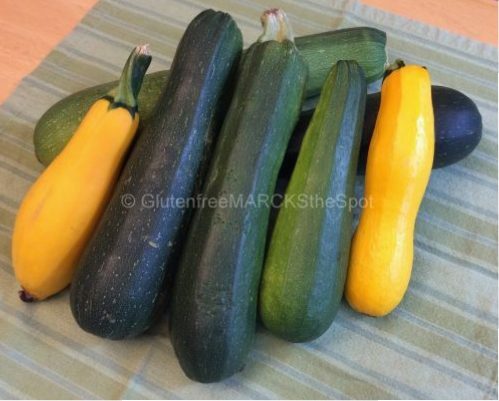 What’s your favorite way to prepare zucchini? 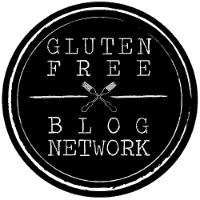 This entry was posted in Gluten Free Living, Recipes and tagged gluten-free zucchini dinners, how to cook zucchini, zucchini dishes. Bookmark the permalink.